This boutique condo brings fresh contemporary style and understated chic to the heart of Waikiki. One- and two-bedroom condominiums feature floor-to-ceiling glass doors that open to a large, tiled outdoor lanai. Views of the ocean, city and mountains are drawn into the cool colors and airy ambiance of the indoors. Beautifully appointed kitchens invite entertaining, while the bath is luminous and features an over-sized shower. All rooms include complimentary Internet access. 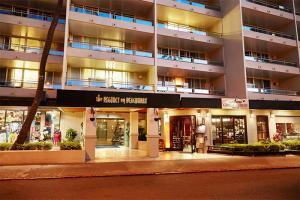 Located in the heart of Waikiki, just a short walk from the beach, and adjacent to the new Waikiki Beach Walk. Plantation Cafe, Royal Garden, Yuzu, The Signature Prime Steak & Seafood. Waikiki Beach Walk, ABC Stores, 2100 Kalakaua Avenue, International Market Place.